What’s as good as Colcannon (Irish mashed potatoes) for dinner? Colcannon for breakfast of course! I prepared this breakfast on a weekday morning in 5 minutes using colcannon left over from last night’s dinner. The hardest part of this recipe is poaching the egg. A fried egg works well too. I have tried several methods of poaching eggs over the years. The way my mother taught me to poach eggs works the best. Mom and I tried using vinegar. While vinegar helps to keep the egg whites pretty, I’m not a fan of vinegar flavored eggs so I don’t use it. I also have an egg poaching pan and silicon egg poaching cups. These gadgets work well when poaching several eggs at the same time but if you are just making a couple eggs, don’t bother using them. The article below does an excellent job demonstrating how it’s done. I often use a slotted spoon to lift the egg up and keep it from sinking. Poach the egg as instructed above for 2 minutes for a runny yolk and up to 4 minutes for a firmer yolk. Timing will also depend upon the size of your egg and how cold it is. I have an ultra runner pal who likes to poach his eggs for 6 minutes. To figure out how long you like to poach your eggs, gently lift the egg out with a slotted spoon. If after inspecting the egg it needs more time, you can always drop it back in the water for another minute or two. 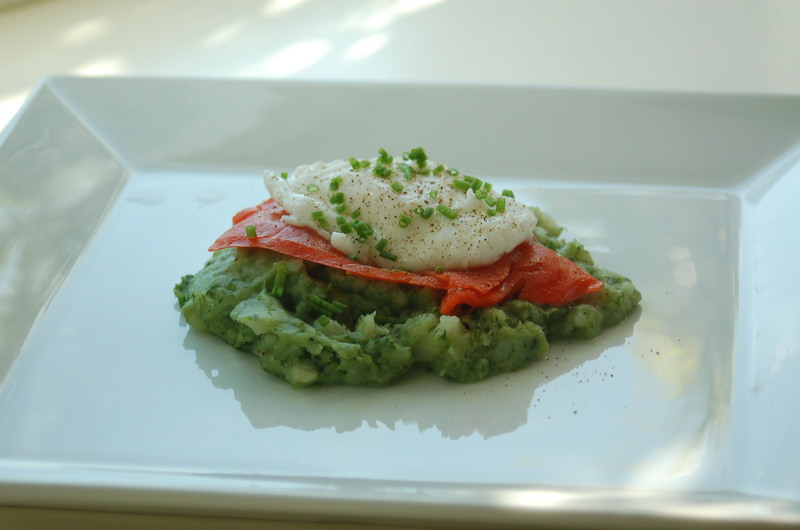 While the egg is poaching, warm the colcannon in the microwave. 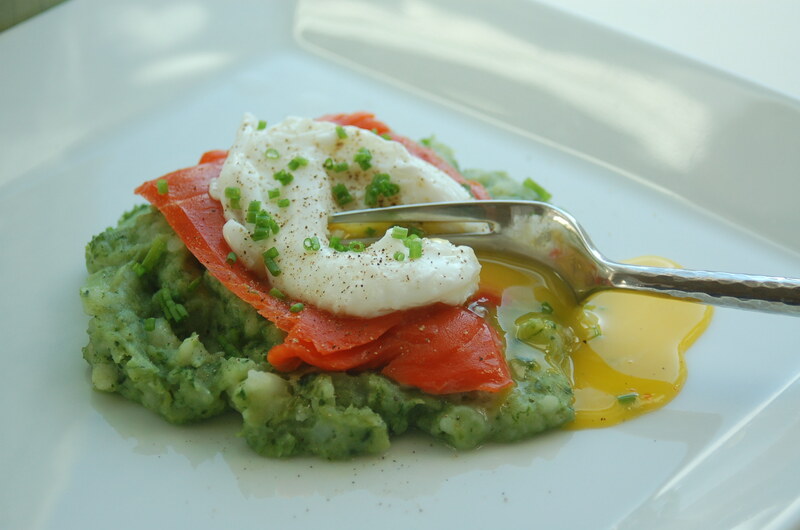 Place the smoked salmon on the colcannon, then place the poached egg on top. Make sure the egg is not wet. Garnish with finely chopped chives and season with salt and pepper.